Friendship is at the core of John Allison’s work, and he’s created deep, compelling character dynamics in the pages of his long-running webcomic Scary Go Round and his creator-owned Boom! Studios ongoing, Giant Days. Personal relationships continue to be the focus for his new Boom! 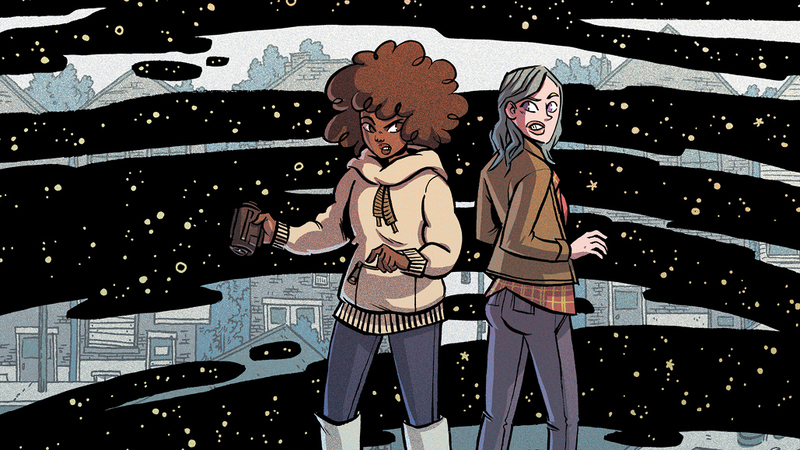 title, By Night, which teams Allison with artist Christine Larsen and colorist Sarah Stern to tell the story of two high school friends reunited after drifting apart in college. Rich characterization is the most important quality for an artist working with Allison, and Larsen has developed the skills to make this cast complex and engaging. “I think it is possible to convey emotion in more than just expression,” says Larsen. “Framing, body language, and lighting all play important roles in conveying a scene. I’ve done a number of no-dialogue stories of my own devising over the years, and I am using all the tricks I’ve learned through making those in the work I am doing for By Night.” Reader can follows these friends on their multiversal adventure when By Night #1 goes on sale June 13, but in the meanwhile, get to know Heather and Jane in the pages below.